Trondheim, Norway: A new semi-quantitative method that enables researchers and others to assess the environmental impacts posed by alien species has now been implemented in Norway. While the method is tailored to the Norwegian environment, it can easily be adapted to other countries, and fills an international need for a quantifiable, uniform approach to classifying and assessing alien species. The publication that details the potential impacts of alien species in Norwayis now released in English. The development of the new methodology was spearheaded by Professor Bernt-Erik Saether and Dr. Hanno Sandvik at NTNU's Centre for Conservation Biology (CCB, now the Centre for Biodiversity Dynamics, CBD) and was fine-tuned in cooperation with a coalition of researchers from different institutions in Norway and staff from the Norwegian Biodiversity Information Centre. “This provides an objective classification of these species' potential impact on the Norwegian environment. We relied on much of the same principles as are used in the preparation of “The 2010 Norwegian Red List for Species”,” says Professor Bernt-Erik Sæther at CBD. There is no common international method for alien species assessments. The EU has just sent out a call for tenders concerning a “Framework for the identification of invasive alien species of EU concern”. “We hope that EU finds our work interesting. We have established a sound scientific methodology, and find that the results are well received by the end-users”, says Ivar Myklebust, NBICs Director. 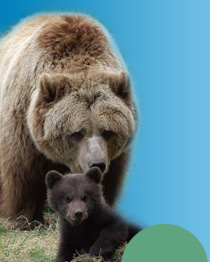 The method classifies species according to their ability to spread in, and their effects on, the Norwegian environment. This information allows researchers to plot the risks posed by each species on two axes, one of which shows the species' likelihood of establishment, spread and dispersal, while the other shows the degree to which the alien species will interact with native species or transform habitats. - Species with severe impact (SE) are actually or potentially ecologically harmful species and have the potential to become established across large areas. - Species with high impact (HI) have either a restricted/moderate ability to spread, but cause at least a medium ecological effect, or alternatively only a minor ecological effect but have a high invasion potential. - Potentially high impact (PH) species have either high ecological effects combined with a low invasion potential, or a high invasion potential without any known ecological effect. - Low impact (LO) species have no substantial invasion potential and ecological effect. - Species with no known impact (NK) are not known to have spread and have no known ecological effects. The criteria are applicable to all species regardless of taxonomic position. Norway's first official foray into evaluating the impacts posed by alien species was with the publication of the “2007 Norwegian Black List” by the Norwegian Biodiversity Information Centre. Only 217 species were assessed in this first effort. 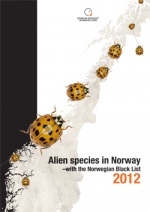 Our new publication, “Alien Species in Norway – with the Norwegian Black List 2012” includes impact assessments for all 1180 known reproducing alien species in Norway. The 217 species assigned to the two highest impact categories – severe and high impact – are on Norway’s Black List of alien species. The work also includes information on the 1140 non-reproducing species known from Norwegian territories, including Svalbard, as well as data on distribution and pathways (vectors) into Norway. Sandvik, H., Sæther, B.-E., Holmern, T., Tufto, J., Engen, S. & Roy, H. 2013. Towards a generic ecological impact assessment of alien species in Norway: a semi-quantitative set of criteria. – Biodiversity and Conservation 22: 37-62. The Norwegian Biodiversity Information Centre (NBIC) collaborates with researchers, government officials, NGOs and other knowledge producers to collect, process and share biodiversity data. This information is made available to the community via a range of products and services, including risk assessments of endangered species and alien species, digital services on species observations and species mapping, and the classification and assessment of Norwegian habitat types.